The Pea Charm is one of our most ordered stamped charms. 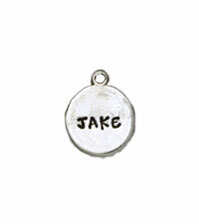 This dainty charm can fit one large initial or a name up to 4 characters. The stamped Pea Charm is a simple shape perfect for a name or initial. This sterling silver charm can be stamped with up to 4 characters for a name or a 1 large letter initial. Up to 4 characters can be stamped on this charm in our Nelle or Lizzy font. The charm is approximately .5" x .5".